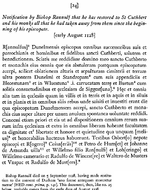 Cartulary: Durham Episcopal Charters 1071-1152. H. S. Offler. Surtees Society, V.179. Surtees Society, Northumberland Press Ltd. Gateshead. 1968.